"You have assembled an efficient work team from start to finish, and I just wanted to pass on my compliments to you and your staff for a JOB WELL DONE." ​"Thank you for a job well done and compliments to your crew; my wife mentioned how professional everyone was. I will be glad to refer your company for your services"
"I believe your company went above and beyond what was expected. The crew showed up early, got right to work and finished the job by the end of the day. They were very professional. More work was needed than they originally thought. They completed their work, cleaned up and never asked for more money for the extra work. Kudos to your men! They deserve it." "We would like to acknowledge the excellent job your workers did putting in a new driveway at our residence. we would highly recommend your company to all of our friends and neighbors." Just a note of thanks for the additional layer of asphalt. We think the crew were great and after 4 months we're still very satisfied. ​"Thank you, I am very pleased with the end result. I will be sure to call when my driveway needs service"
I have been a customer of Sure Seal for 21 years – with good reason. They have been extremely reliable, fairly priced & with excellent quality work. 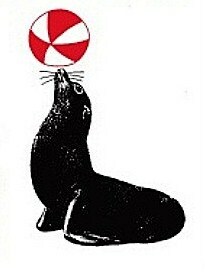 I have recommended Sure Seal & some of my friends have employed them. I want to let you know how pleased my wife and I are with our new driveway resurface. Your work crew was courteous and hard working and took pride in their work and the results show that. From my initial contact with Sure Seal LLC until the completed project everything was done in a timely and professional basis. I don't have enough words to express our heartfelt gratitude and the amazing work you did with re-surfacing our driveway. Last Sept. we were advised by our HOA we had to seal coat our driveway by the end of October and they gave us a referral to a company (C&C Paving). (FYI - I don't like being told who to use for my home). David & I did not know if we wanted to seal coat or re-pave our driveway. We only knew our HOA mandated we seal coat by Halloween but we knew our driveway was old and bumpy and worn. We never had our driveway re-surfaced and knew nothing about the process. 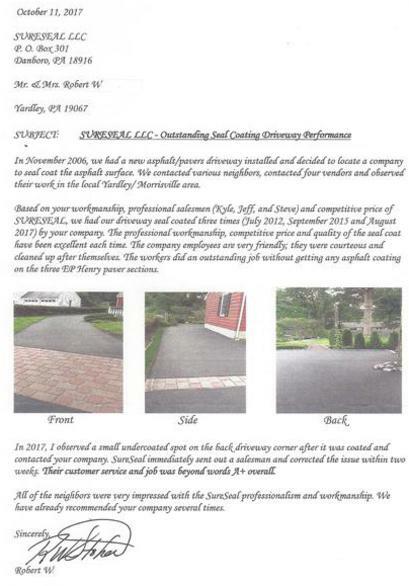 So, I googled "seal coating Lansdale" and Sure Seal popped up and I checked out your website and requested an estimate for seal coating and re-paving. Mr. Steve Rogers came out and wrote an estimate for seal coating and re-surfacing our driveway. I must admit, we had "sticker shock" when we saw the estimate. So we secured three other estimates from competitors, including C&C; all varied in price and description. Our brains were exploding with terminology and descriptions. Why weren't they all identical in wording? Isn't it the same thing? We asked everyone for seal coating and re-paving. Did one call something "x" and another the same thing "z"? We were confused and this was going to be an expensive improvement for us. We needed clarification. During this time of decision, I also called Steve at your office w/questions about the Sure Seal estimate and he answered them, without hesitation and explained it so I'd understand. He always made sure I understood before ending a call. When I called the other contractors with questions about their respective estimates, either no one answered or returned my call. The one contractor who did answer, kind of brushed me off as I asked questions, like I was bothering them. While we were contemplating this project, David would talk to a co-worker and we had questions. I'd talk to someone and have questions, so I called Steve, a lot! And... he always answered the phone & returned my call w/in 24 hours, if I ever left a message. I had a question, he answered it. During this time, I confess, I asked Steve about the competitors' estimates. I explained I had questions on their estimates and was getting nowhere and really want to make an informed decision. I told him the description on the estimate, the names of the competitor and my questions. He made sure I understood the competitors estimate and helped me compare them to Sure Seal's. Wow! Talk about amazing customer service! Where do you find such honesty anymore? Such helpfulness? He could have refused or lied or anything like that but didn't. He made sure David & I knew the process, similarities and differences so we could make an informed decision. Between Steve's knowledge, professionalism, returning calls, honesty, friendliness and patience with my incessant questions, even on the competition, we were sold! and signed the contract w/Sure Seal. Then in early 2017, Robin called us to schedule our re-surfacing. She was so pleasant and understanding when we advised we wanted to wait till Spring of 2017 (as winter seemed to never end and linger). She even answered questions I had as the day got closer -- dry time, parking on it, driving, walking on it, trash cans etc. And the day arrived! Yesterday, April 10, 2017, Sure Seal promptly arrived at 9:00 a.m. and re-surfaced our driveway. David & I forgot to remove the decorative landscaping stones, yet, your workers removed them before starting the job and then put them back after, exactly where they were! Four hours later, we had a brand new shiny driveway -- straight, smooth, edged off, no depressions....it's perfect! absolutely perfect! David & I were always treated with kind, courteous, friendly, knowledgeable and professional staff from Sure Seal, everyone from Robin to Steve to the workers who did the re-surfacing. We have recommended you to our neighbors even before the actual re-surfacing! (when we told them we were doing it and it may be noisy, they asked and we praised Sure Seal) I wish you did roofs and siding too! Those are next on our house.We hope that the CEO, COO, owners and powers that be, at Sure Seal know what an all around amazing staff of individuals they have in Robin, Steve, the workers...Everyone there! Thank you all so very, very much for making this decision so easy, and the process so smooth, from beginning to end. We will definitely be using Sure Seal for all our driveway needs! Just wanted to drop you a note to say that Bill did an excellent job with the Belgian Block yesterday. It is exactly what we wanted, and how we wanted it. ​Our driveway looks terrific. Great job! Thank you so much. As always thank you for your service. Just a note to thank you for the great job you did on my driveway. I am pleased with how it turned out. The men you sent were very nice also. I just want to let you know how pleased I am with the work. I own a business as well and I know what it takes to deliver a quality product. Thank you. Your crew did a great job! Very professional and detail oriented. (especially Sig) were courteous and hardworking! This resurfacing was the fourth time in 46 years and by a wide margin, the Best! Thanks again and I'm looking forward for the sealing of our parking area next month! Thank you for employing and training an amazing crew. Sig was professional hardworking and exceptionally capable. I am impressed with the workmanship and will recommend Sureseal to all my neighbors. I am very pleased with the resurfacing of my driveway. They did a great job. I would definitely recommend your company to any of my friends or neighbors. Just wanted to pass along a few comments from the delivery of the firewood. The young gentleman that you sent did an outstanding job. I was extremely impressed with his work ethic, attitude, manners and just how he handled himself. He certainly is a very valuable employee for Sure Seal. He represented your company very well. He worked hard and stayed with the task until completed…even cleaning up all of the wood chips from behind the truck. With all the negative things that are always published about the “younger generation”…whether on the internet, on TV, or in newspapers, it is always nice to see that not everyone is “like that”. There’s still a lot of good young workers out there and Sure Seal is very fortunate to have one of those success stories working for you. We were very pleased with the job your crew did on Monday. They were very industrious, but also careful and the final result is professional. They were finished in half a day and cleaned everything up. The “new” driveway looks wonderful. We would like to schedule, or be reminded of, a sealing in the spring. Perhaps in late April? We want to try and take better care of the paving this time around. We would like to have a call about seal coating the driveway. Thank you. The driveway is wonderful. Everything as we wanted it. Your workers were very nice and did a really good job. We have been using Sure Seal for our gravel driveway for many years. & the quality of their work is excellent. They do an excellent job of snow removal as well. We have recommended Sure Seal to our friends & neighbors – some of whom have used you. You can be sure that we will remain a loyal & well satisfied customer. Yes, we are very pleased with our resurfaced driveway. The sureseal team was fantastic. Everyone was professional, courteous and helpful. All of my questions were patiently answered. I will be sure to tell everyone about my driveway. I must say I am very pleased with your professional, punctual service. I have already recommended your services. Keep up the good work. Thank you. The driveway looks great! We had a really good experience with Sure Seal from a service perspective. Our office contact, Robin, always kept in touch with us and let us know the next steps in the process (we had curbs/garage sills replaced, a new walkway put in). The communication was key to our satisfaction, as the weather was a challenge to finishing the job. We would like to have you seal the driveway when it’s needed, so please let us know how to get on your calendar. Sig and his crew did an excellent job on our driveway. They was courteous and professional and completed the job in only about four hours. The driveway looks great and the team cleaned up all debris after finishing. Thank you, It looks fantastic. Your team did a great job, and were very professional throughout the project. The guys did a great job. Looks just fine. Clean and neat. We both reviewed the booklet and are now designated 'driveway police' to be sure no one is doing the power steering thing.Out of control will be deliveries like fed ex and ups. Jeff was terrific. Truly appreciated him taking the time to explain the process, the final product, crack issues and edges. Install crew as I said was very good. I have to honestly tell you I had no idea it took all that heavy equipment and that many people to get the job done right. And your trucks were impressive in both size and how clean they were. Gave them $20 and snapples, they did perfection, wow, I gave you a referral in Holland pa (the contractor rick Osborne, Osborne builders, also mentioned that you are the best). I will certainly recommend. Just want to say what a great job the crew did on my driveway this week. So pleased with the end result. Great bunch of guys, very professional despite extremely hostile (hot) conditions. Thank you for doing a wonderful job on our NEW driveway! Everything was done exactly how you informed us it would be done, no surprises, no extra work and just an all around fabulous job by the team. We have yet to remove the tape and use the driveway given the extreme heat - but can’t wait to do so at the end of the week. After some rain showers, no visible puddles! Again, great job and we are very satisfied. Thanks! Yesterday you folks completed a re-surfacing of our driveway that is shared with three other residents. Your people were extremely efficient and courteous, guided by "Sig" who was very helpful and kept us informed along the way. As early as it is, the work seems to be top-notch and we will look forward to further sustaining it with a seal coat at the appropriate time.